So my baby turned 4 a little less than a week ago and I made these amazing Chocolate Surprise Muffins for him to take into his Preschool. I frosted them and made them into cupcakes for all the kids to enjoy. This recipe comes from the Cake Mix Doctor and is super easy to make. I first had these at my sisters house and I am not a fan of chocolate but they were so good I ate two! You Defiantly give them a try! 1. Place the cream cheese and sugar in a large mixing bowl. Beat with an electric mixer on low speed until combined. Add the vanilla and egg. Beat on low until the egg is incorporated. Stir in the chocolate chips. Set the filling aside. 2. Preheat the oven to 350 degrees F. Line 24 muffin cups with paper liners. Set the pans aside. 3. Place the cake mix, water, oil, and eggs in a large mixing bowl. Blend with an electric mixer on low speed for 1 minute. Stop the machine and scrape down the sides of the bowl. Increase the mixer speed to medium and beat for 2 more minutes, scraping down the sides again if needed. The batter should look thick and well combined. Spoon the batter into the lined muffin cups, filling each liner two thirds of the way full. Spoon a heaping teaspoon of the filling onto the center of each muffin. The filling will sink into the batter as the muffins bake. Place the pans in the oven. 4. Bake the muffins until they spring back when lightly pressed with your finger, about 23 to 27 minutes. Remove the pans from the oven and place them on wire racks to cool for 5 minutes. Remove muffins from the pan and cool on a wire rack for 15 minutes before serving. * You can frost these and they make wonderful cupcakes or enjoy on their own. I know it is the day after Easter but I just had to share this. I made these cute little packets for all of the kids in my daughters preschool class. 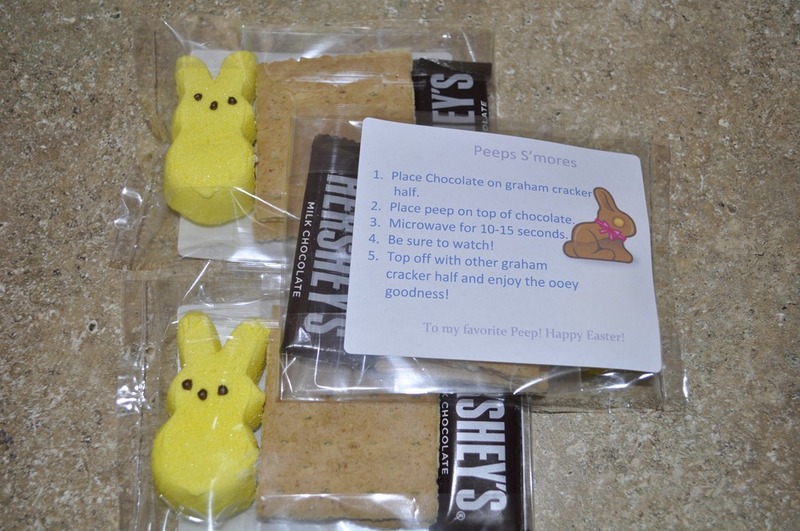 I thought it was such a cute way to use Peeps, which I am not a huge fan of. 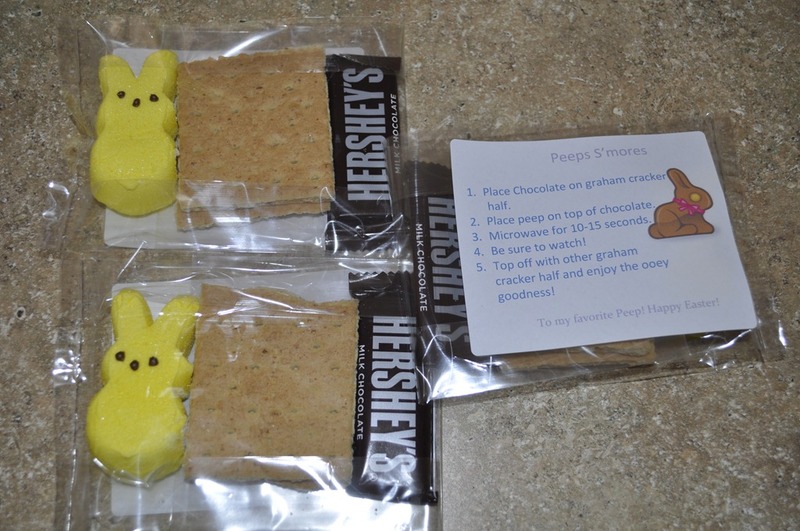 I stuffed bags with a peep, 2 graham cracker halves and a mini Hershey’s bar. 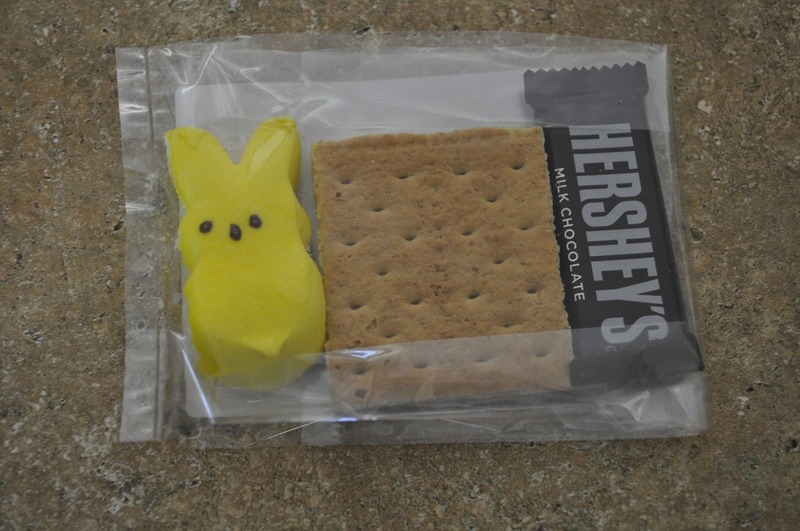 Just enough to make one Peeps S’mores. 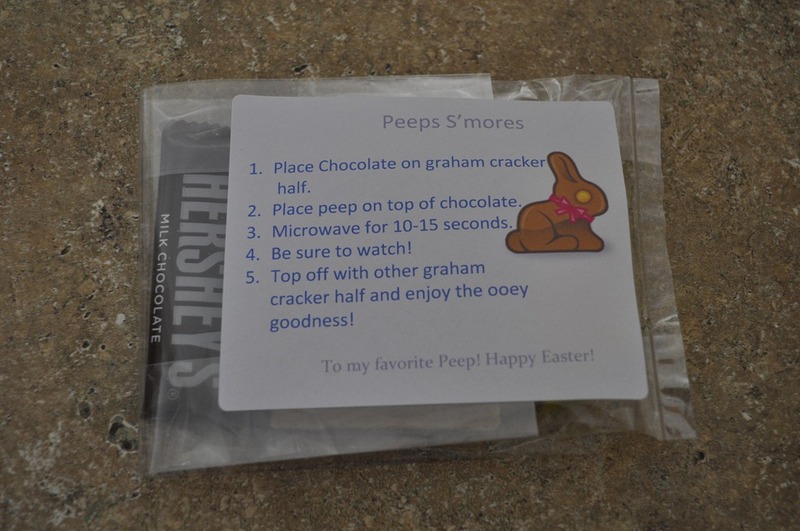 Then I printed of labels with the directions for how to make the Peeps S’mores in the microwave and sealed the bag closed. I think that all the kids loved them and they were a cute Easter gift. Below is an attachment for the labels that I used. They Print on 3 1/3” x 4” label size.